You are here: Home / Travel / Old Charleston Jail: Scariest Place In The State? Old Charleston Jail: Scariest Place In The State? Ryan and I love haunted attractions. We’ve done haunted tours in Charleston, Gettysburg, and Key West as well as doing numerous haunted houses around Halloween. When we arrived in Charleston we were told that if we liked haunted attractions that we had to visit the Old Charleston Jail. This jail has a really dark past. It has served as a Civil War prison, surviving an earthquake, and being the final stop before the gallows for some of Charleston’s most notorious criminals. With all of this negative energy it is no surprise this place is so haunted. 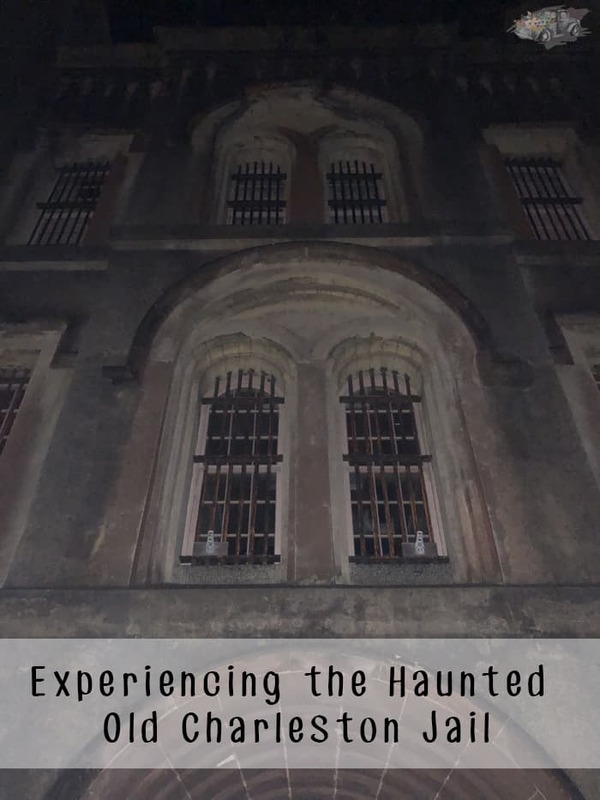 Featured on Ghost Adventures and many other ghost-hunting shows, the Old Charleston Jail and its guides from Bulldog Tours have made this famous landmark, well, infamous. The tours take place after nightfall and the jail is an imposing structure in the daylight, but after dark it is downright terrifying. The tour groups gather just inside the jail’s main gate and the atmosphere already feels dark and oppressive. While you can technically take minors on the tour, I strongly recommend not taking any children under 13 on the tour. It’s simply too intense. Upon entering the jail, we gathered in a room with ropes hanging from the ceiling and shackles bolted to the floor. It turns out this was the torture room. This room has been the site of several possessions as well as other anomalies. I kept feeling a fluttering on my arm. I hope it was some sort of a big bug but unfortunately, it will return later. In the second room was where some of the cells were — including the shared cell of John and Lavinia Fisher, probably two of Charleston’s most notorious criminals. Legend has it, John and Lavinia plotted an escape through one of the second-story windows. John’s escape was successful but Lavinia’s wasn’t. In fact, her ghost has been seen in the window where she failed to escape. John was so dedicated to his wife, however, that even after escaping he didn’t want to leave her behind so he turned himself in. I was standing with my back to the windows and I kept feeling as if someone was watching me. In fact, Ryan kept asking why I was looking behind me. Once again I’m hoping it was nothing. The third room was in the basement and although it didn’t have as much of a dark history, the room was completely pitch black. While in that room I felt some flutters on my arm again. Hopefully that darn bug. The entire tour only lasted 30 minutes but it was intense. Adding to the oppressive feeling was the fact that the jail was about 10 degrees hotter than outside. Apparently it is always like that. While this tour was focused more on haunts than history, there is a daylight history tour which looked fascinating. We’re going to have to be sure to check out that tour next time we are in town. This tour was definitely worth the time and money. I’m not sure we actually experienced anything supernatural but as I said before there is definitely dark energy there. Check out more about the City Jail tours on the Bulldog website.